Hello fine people of myArmoury I am asking you to help me find and identify a dagger that I one day plan on turning into a project. The dagger is a 14th century Swiss dagger that is silver mounted. Any information about the piece like what museum it is currently held in, measurements, or anything would be greatly appreciated. I believe that sold in one of the auctions form Fischer Auctions. I am pretty sure this dagger came up for sale on Hermann Historica's auction site. Assuming this is the case, you'll have to look through the past auction catalogues to find it. By the way, be aware that there are a substantial number of modern fakes that end up for sale even at professional auction houses. I am not completely certain that this dagger is a historical piece. 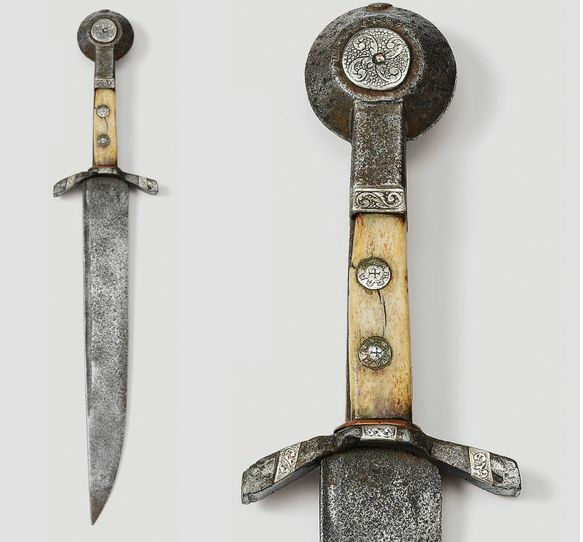 The decor, while possible on a later dagger, feels a little bit odd (especially the pommel inset) and overdecorated for a 14th century dagger. Additionally, something about the pitting and rust seems like it could be modern. However, I really do not have enough details to say with any certainty; it may well be an antique. If, however, making sure that you have a historically valid dagger rather than something a modern person has created is important to you, I might give this dagger a pass. Uncertainty about its actual age means you could be copying something that's not even 14th century at all. Thank you both fine gentlemen for your quick responses. I will check the catalogs of the past auctions to see if I can find anything. Also I got 14th century dating from the lable on Pinterest so I took the dating as you did with a grain of salt. It could be 15th or 16th century. In your opinion if the piece turns out be real what period do you think It could have came from? I would be very, very cautious of that dagger as source material. As Nathan and Craig have noted, It has appeared in a number of auctions, first with Galerie Fischer, (Who now no longer do arms auctions, partly because of the number of forgeries out there.) and then multiple auctions with Hermann-Historica, where it has failed to sell. I do not know if it has finally been sold on or remains in the hands of a private collector, but the fact that it has not sold for multiple auctions is a big warning sign. I, (and I know several of my peers share the opinion) am very sceptical about details of this dagger. As Craig has noted, there are a lot of stylistic details in it which are highly questionable - the engraving pattern on the silver is one that seems extremely anachronistic for its purported date. I'm also cautious of the proportion of the blade - the fuller is quite crude and not what I'd expect on a blade that size. (the disproportionate pommel, however is rather a Swiss fashion, there are two examples of the type with far less suspect blades in Hugo Schneider's Waffen im Schweizerischen Landesmuseum, Griffwaffen I, both of which have applied heraldic decoration rather than the foliate patterns on this example.). The patination is not impossible, but again raises some significant questions. In all, I would not recommend anyone to use that as an example of medieval arms. It might be real, but my gut instinct says its as bent as a $3 note. In your opinion if the piece turns out be real what period do you think It could have came from? Oh, its a real dagger. Just not a real 14th century one. I'd happily bet a tenner if you did analysis of the metal, and carbon-dating on the bone, it would be found to be 19th century or maybe early 20th. The dagger in question can be traced through a couple private collections and was supposedly found in Geneva in 1886, in a house being demolished... Not that this proves anything! For further comparison, there is another one with the heraldic appliqué in the museum in Bern, and a couple other similar daggers have been excavated in France. One more is in a museum in Liege, but the provenance goes back only as far as a private collection that includes some pieces that seem dubious to me. Such daggers have recently been dubbed "Dagues Savoisiennes" by my friend Nicolas Baptiste in the catalogue of the recent exhibition Armatus Corpus that took place last year in Morges (Switzerland) - while I'm more inclined to call them "Burgundian Heraldic Daggers" myself, as Charles Buttin did back in the days. The blade on the dagger you are asking about, Aldo, seems genuine XIVth century to me, as do the guard and perhaps the hollow pommel - what is less vanilla is the applied decoration, that screams of XIXt/XXth century pimping. Mark, where does your second example from top comes from ?